UPDATE: Sadly, Google changed something with how their spreadsheets are accessed, and now fetching the data causes an error/alert. So much for thinking that Google Spreadsheets would be the easiest way to access this data... If you're interested, here are code changes that can get it to work again. II. So... Why Not D3? Most data visualization that you'll see are static and non-interactive. However, new possibilities open up when you start to explore animation and interactivity. Your data's story can be way more impactful if these extra dimensions are used well. Hans Rosling's famous TED Talk would not have been nearly as compelling if he just showed static images. A visualization that's never seen is useless. The less code you have to write, the better. If someone has already written code that does what you need, use it! Right now, as I write this, there are 48,566 modules on npm, and there will be more by the time you read this. Using a tool like Browserify you can use these modules very easily in the browser. Chances are very good that something you'd want for your visualization is available for use right now, just one npm install away. We're only going to use two modules from npm in this example: superagent, for making AJAX requests and csv, for parsing csv data. D3 has a whole lot of functionality to help you create some pretty amazing visualizations, but the techniques I'll cover should translate to creating any browser-based visualization, regardless of tool. While D3 is an amazing tool, it's important to remember it's just one tool in our toolbox. It can be helpful to think about what we want to achieve at more of a conceptual level first before thinking about how to use a specific tool. When creating data visualizations it's helpful to think of the process containing 5 "steps." I put "steps" in quotes because it's much more of an iterative process than it is a sequence. - Get the source data into the browser. - Ensure the correct format, add any additional wanted data. - Add visual elements to the page. - Get it out there so other people can see it! 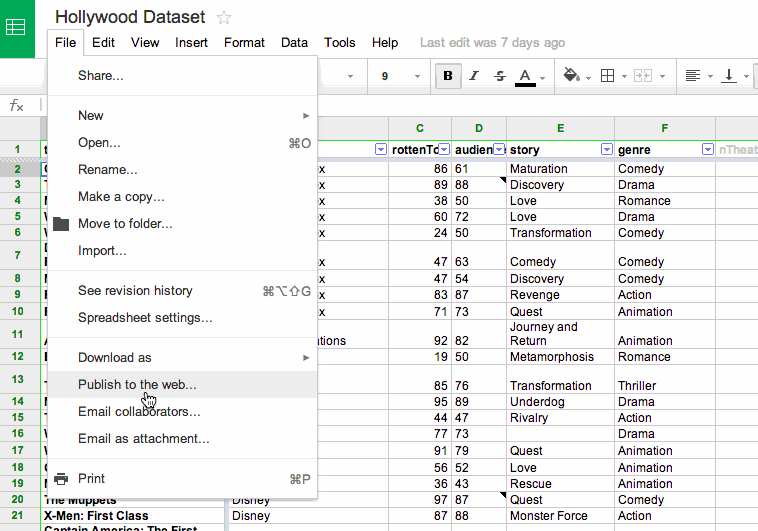 - Make an AJAX request to the Google Drive spreadsheet to get its csv and parse it. - Change the format to something easier to work with and add an additional metric "quality per dollar." - Append html divs to the page, each representing a movie in the dataset, sized relative to its "quality per dollar"
- Listen to mouse hover events and populate the sidebar with more of the movie's data. First, make sure you have Node.js installed. This project was made using version 0.10, anything higher will probably work. Next we'll want to install Browserify, to package our modules up into a "bundle", and Beefy, an awesome local development server that will automatically bundle up our visualization (with Browserify), and serve it up with a barebones index.html for us. Beefy should now be running on port 9966 (and it should tell you as much). Open your browser to http://localhost:9966. If you see that alert message, we're ready to go! Since we're storing our data in Google Drive, the first thing we have to do is use the "Publish to the web..." feature so that our visualization can access the data. Once we have a link to the data as CSV, we can create a module to fetch and parse it. As mentioned before, we're going to use two modules from npm to do the fetching and parsing: superagent and csv. Let's install them now. From your command line, we'll tell npm to install those packages and store them as dependencies in the package.json file. I don't love that data format. Also, I'm interested in a metric that isn't in the data. I want to know about "quality per dollar" -- how many Rotten Tomatoes points a movie received per dollar spent. Let's fix this in step 2. Our transform step will be very simple. We'll first change the data format from an array of arrays to an array of objects, this will make working with it in the next steps easier. Then, once we do that, we'll just use two of the existing metrics, Rotten Tomatoes Score and Budget, to calculate a new one: "Quality per Dollar". Now that the data is taken care of, let's move on to the visualization! For our display step, for each movie we'll add a div to the page, relatively sized according to its "qualityPerDollar" value. Alright, we're getting somewhere! Let's add some interaction so we can see what those movies are! Alright, so now that we have it all working, how do we publish this so others can see our work?